The Chinese culture is filled with food traditions and symbolisms, so much in fact that I could never keep up and remember them all. During the entire 6 days surrounding my wedding, I deferred to my mother to tell me what to eat to please the Gods of good fortune and fertility. Oh, did I want to have some grapes? I had to eat five of them, not one less because that number that I must not utter, one less than five, means something bad in Chinese. In fact, I am choosing each and every word very carefully in this column so that in case YOU are the one getting married, I do not want to be blamed for any misfortune! One custom that we opted out of was serving a whole roast suckling pig at the wedding banquet. According to the Chinese, the pig symbolizes the virginity of the bride, and um, you know where I’m going with that. I say, no sense in pretending or misrepping what is not true, because that would be a lousy way to begin a marriage! Plus, where the heck would we find a whole suckling pig in the middle of a gucci golf resort? Can you even imagine the chef struggling to fit the fat pig on his fancy rotisserie grill? So, I created this Long Life Fertility Noodles Recipe that covered all your important bases – sort of cramming in as much good fortune as possible on one plate. The sesame seeds and pea pods in the noodles symbolize fertility (remember, if you don’t want children, substitute with any greens, bean sprouts or sliced bamboo shoots.) 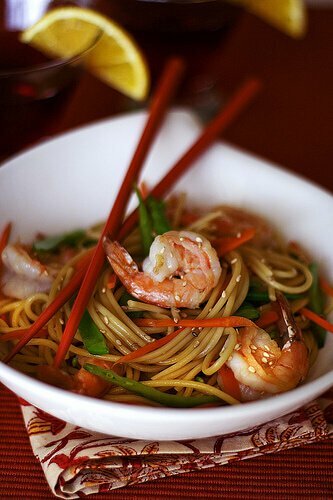 Shrimp, in Chinese, is pronounced “haa” which sounds like laughter, and may your marriage be full of happiness. And of course, this column has 688 words, my way of wishing you a smooth path to double prosperity. This was a simple setup, with the big glass window the the right. Yup, that’s my kid’s breakfast table that I’m using. 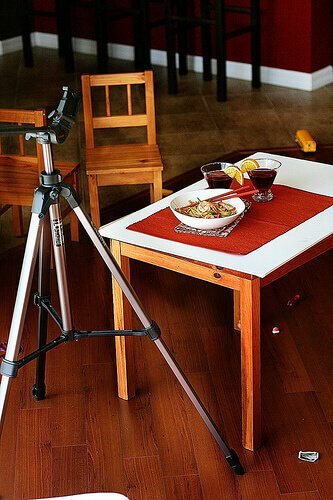 I’ve been noticing that both Bon Appetit and Gourmet magazines have been lots of overhead shots of food. Not a style that I’m fond of – the food isn’t as intimate and you lose a lot of texture from above. But, I wanted to try it and see on this dish. Take a look at the second photo (above) Do you know how (*&$!!%! hard it was to stand on an itty bitty stool and balance while holding camera still enough to focus? Half my shots were blurry! heehee! And yes, I know I could have just put the entire thing on the floor and used my tripod…but at that moment in time, I just wasn’t smart enough to think of that. Plus, that was going to be our dinner and who know what random toy airplane, spaceship or car would roll right over the food. Usually, when a toy car goes whizzing by, 2 pairs of pitter patter bare feet are chasing it.